Guardians of the Galaxy – 4/5 – Movie Reviews by Ry! 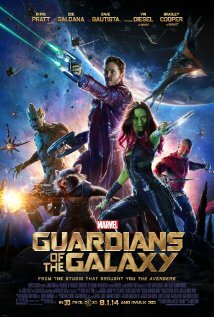 Guardians of the Galaxy – 4/5 – Marvel Studios has become what Pixar was for about a decade; a movie studio that knows how to make amazing films. No matter what they put out (Iron Man, Thor, and The Avengers) they constantly hit it out of the park with entertaining films. Their niche is very welcoming, as it keeps the audiences yearning for more. This film, when announced, was consider a very ‘risky’ venture. After watching this film, I have come to the conclusion that Marvel just knows how to make entertaining films no matter what risk they take. Premise: In the far reaches of space, Peter Quill and his ‘Guardians’ find themselves the object of a manhunt after stealing an orb coveted by the villainous Ronan. With the Universe at stake, Quill must learn what it means to lead, and be the man he was born to be. Even in supporting roles, they all do wonderful in providing vivid personalities to each individual. No matter what they are doing in the film; they provide a witty punch, adding uniqueness to this already ‘intriguing’ tale in space. Random people with (insert purpose) are brought together through (insert crazy circumstance) and must battle against a central evil to (insert future calamity). This isn’t something you haven’t seen before. When you have something based on circumstantial scenarios, you have to provide artistic qualities to all other areas (characters, story and visuals). The third will be explained later, but to speak about the other two (in repeating from before), Gunn provides that depth and ‘unique’ perspective to this ‘Marvel lore’ to bring life to the characters and story. All five characters have come together and must protect an ‘item’ of significant value, one that both Ronan and others want for their own purpose. Bringing in the ‘ultimate’ macguffin helps bring a common thread throughout the film, weaving an entertaining adventure within the ‘space’ aspect of the Marvel Cinematic Universe. This is pretty much how the whole film goes. There’s no ‘forced’ exposition, just a good old space adventure. As the film moves along, you have the allure of ‘ominous’ approaches and ‘exciting’ space battles blending in with witty dialogue, dramatic situations and obvious ‘good’ vs. ‘evil’ confrontations. The film moves smoothly, pacing between all three acts perfectly. Once we get to the climax, it is a buildup of the unexpected, one that brings all the quirkiness you’d find in a James Gunn film combined with the awesome quips of Marvel-eque comedy and endings. You realize (by the end) that there is a lot more questions to be answered (because of cameos and other Easter eggs) but it is what makes the film ever so special; the yearning to want more of this ‘Guardians’ World. The visuals of this film are beyond description. The imagination is brought to the forefront through the crafting and visual of Gunn and company. They do a wondrous job in bringing to life worlds of the unknown, characters of dreams, and action sequences that are truly; out of this world. There is nothing bad to say about the cinematography. The score is another welcoming layer to the film; adding an excellent ‘push’ to certain situations. The music can be somewhat cheesy, but it is a perfect medium for most of the films running time. Guardians of the Galaxy is a Marvel film that follows in suit with all the others. With a colorful cast, a decent story and wonderful visuals and score; this film will not disappoint. If you’re a fan of Marvel or any kind of space adventure; check this out. You will be in for a ride. Last Vegas – 3/5 – Movie Reviews by Ry!